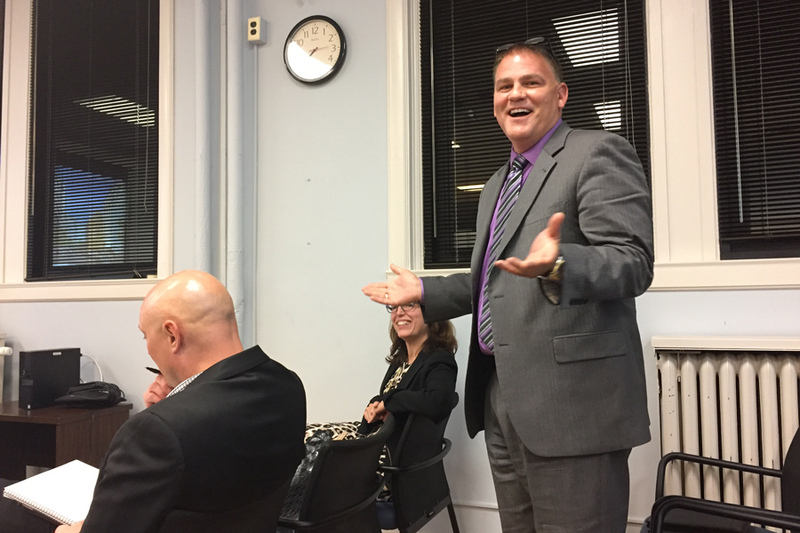 Dale Bradley, who works in Evanston, voices his approval of a proposed 33-story building at a Special Preservation Commission meeting. Bradley said he thought the building would be a “boon” to the downtown area. The Evanston Preservation Commission voted unanimously Tuesday to recommend the planned development of a 33-story building in downtown Evanston despite concerns from some committee members and residents. The building, commissioned by Chicago-based Vermilion Development, would occupy the Chase Bank parcel and an adjacent vacant lot in the 600 block of Davis Street. If constructed, the building would surpass the 22-story Chase Bank tower to become the tallest structure in Evanston. Kerry Dickson, director of residential real estate at Vermilion, said the mixed-use development — consisting of ground floor retail, a drive-through bank and 318 living units — would make good use of the vacant lot. The building would create about 30 permanent jobs and generate roughly $1 million in real estate taxes per year, he said. The developers requested several site variances, like increasing the number of permitted dwelling units by over 200 and decreasing the minimum number of parking spaces by around 275. Martha Koch, who owns the vacant lot and the two-story Evanston building next to it, said she partnered with Vermilion to help preserve the landmark building. She said the building has been in her family for about 50 years and that she wants to preserve it, but can’t afford a renovation. She said selling the lot and working with Vermilion would give her the resources to maintain the building. “Our objective is to preserve (it) and keep it in as good of shape as possible for the next 100 years,” Koch said. Still, several residents and committee members voiced their concern for the project, saying it would change the character of Davis Street. Anne Earle, an Evanston resident who attended the event, told The Daily she has been involved with preservation efforts in the city since 1976. She said the proposed tower is “not compatible” with the rest of the block. Evanston resident Thomas Klein (SESP ’70) told The Daily the building could also raise rent in the area, potentially driving people out. He also said Evanston’s willingness to grant variances to the city building regulations promotes “reckless” development in the downtown area. “When you do that, your exception swallows your rule and then it becomes like the Wild West,” Klein said. Still, though most attendees voiced some concerns about the project, not all of them rejected it entirely. Dale Bradley, who works in Evanston, said the development fits into the neighborhood aesthetically and would be a “boon” to the city. “Anything that brings business to Evanston and more people to the restaurants and retail shops, I think is nothing but an improvement,” Bradley said. The Evanston Plan Commission will review the development plans Wednesday before it goes to City Council for a final vote.